SAN FRANCISCO, CA and BOXBOROUGH, MA – February 27, 2012 – Allegro, a leading supplier of Internet and security software for embedded systems, today at the RSA® Conference 2012 in San Francisco, CA, announced the availability of Suite B cryptography with their Integrated Embedded Device Security Suite. Suite B is a collection of unclassified NSA specified algorithms for bulk-data encryption, hashing, creating digital signatures, and key exchange to improve secure information exchange within federal, state and local governments in addition to coalition partners. Allegro’s Suite B solution is specifically engineered for resource sensitive embedded environments and independently developed by US citizens meeting all Free From Foreign Influence (FFFI) requirements. Pre-integrated with RomPager Secure and RomWebClient Secure SSL/TLS server, Allegro’s Suite B solution is small, fast, speeds development and reduces time to market. In 2005, the National Security Agency (NSA) defined a set of cryptographic algorithms that when used together, are the preferred method for assuring the security and integrity of information passed over public networks such as the Internet. Today, Suite B is globally recognized as an advanced, publicly available standard for cryptography that defines algorithms and strengths for encryption, hashing, calculating digital signatures and key exchange. With Suite B, NSA specified only algorithms not protocols. The National Institute of Standards and Technology (NIST) and NSA have worked to integrated the use of Suite B cryptography into IETF standards. The result, specific RFCs that utilize Suite B have been adopted for several communications protocols including SSL/TLS (RFC 5430). Embedded systems are prolific in virtually all industries. The rapid adoption and deployment of modern communication technologies has enabled unthought-of applications. With it, comes the need for embedded device security. Any network-enabled device must be considered as a potential target for malicious intent. The important and unprecedented need for secure communications has never been higher. Since being announced by the NSA in 2005 and subsequent adoption into IETF standards, the use of Suite B in both commercial and military applications has seen great success. Due to the underlying use of elliptical curve cryptography, Suite B has shown performance enhancements over other cryptography in both enterprise and embedded environments, which has increased the rate of adoption. Once thought to be for use only in military deployments, Suite B can now be found in embedded systems for consumer electronics, financial trading systems, and enterprise networking solutions, as well. The ultimate security level of any product is determined by the quality and proper implementation of the underlying cryptography. Allegro’s Suite B solution is pre-integrated with RomPager Secure and RomWebClient Secure SSL/TLS server and client for use in resource sensitive embedded device application areas such as: Payment Card Industry (PCI), Healthcare and Health Insurance Portability and Accounting Act (HIPAA), Financial, and others. “Network traffic from embedded devices connected to the Internet is projected to experience exponential growth in the coming years. 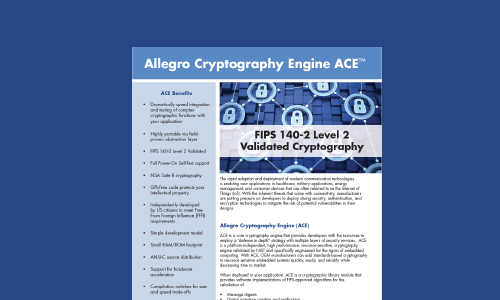 Enabling Suite B cryptography in globally recognized communications protocols like SSL/TLS for resource sensitive embedded systems is a natural extension of Allegro’s expertise” says Bob Van Andel, President of Allegro. Allegro’s Suite B solution is available now and delivered as ANSI-C source. Stop by Allegro’s booth at the RSA Conference 2012, Booth #240 to discuss your embedded device security needs.